The Tigercat 604E cable skidder is a quick, compact and powerful -- well suited to steep slopes, heavy timber and high value selective logging. With high quality components and construction, the 604E is designed for performance, long service life and maximum uptime. 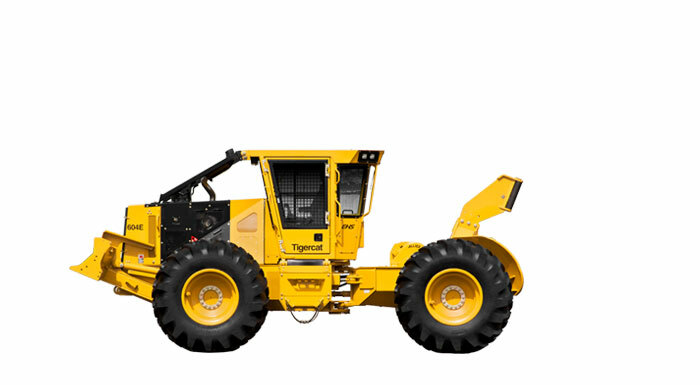 The 604E cable skidder is Tigercat FPT Tier 2 or Tier 4f powered. The Tier 4f engine conforms to the latest emissions standards in North America and Europe. Tigercat’s superior Tier 4 solution is packaged into a physically smaller engine compartment than competing machines, leading to clear operator sight lines and a compact design. Excellent cab ergonomics, the benefits of hydrostatic drive and painless maintenance routines make Tigercat skidders a top choice among operators.